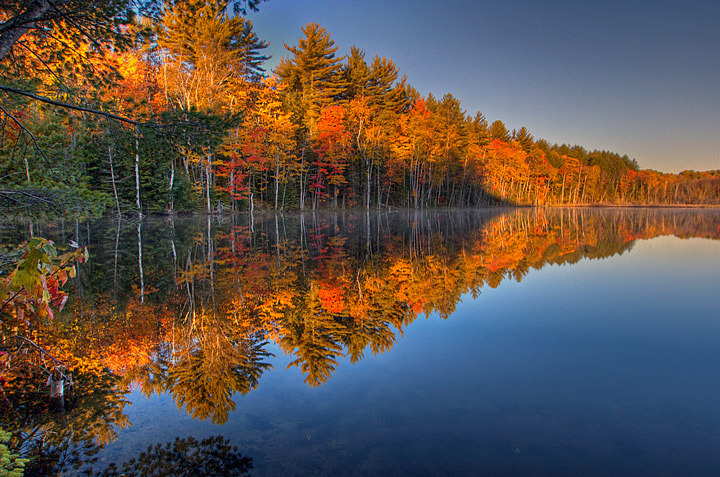 With fall just around the corner it’s time to be thinking of fall photo locations. One of my favorite locations is the area around Munising, Michigan. Generally the interior colors peak around the last week of September with the colors along the lake peaking the first week of October. 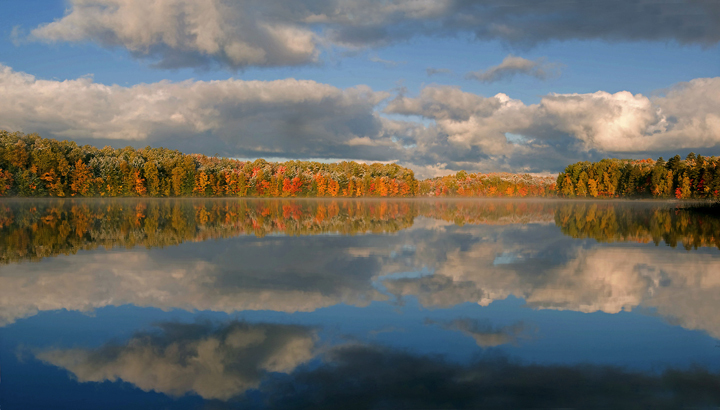 Hiawatha National Forest offers a numerous lakes to photograph during the fall color peak. 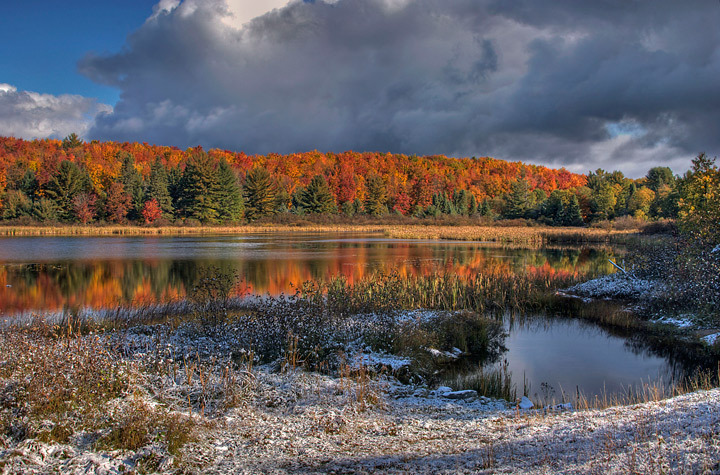 Some of the more popular photo locations are a series of lakes just south of Munising along highway H13. The area has many back roads an lakes so just driving around will likely reveal some great photos. Last year I happened to be in the area during a snow storm which produced some great photo opportunities although it was a bit difficult to photograph in wet snow. Finding the lakes are fairly simple. Drive south from the intersection of H13 and highway 28 in Wetmore, Michigan. At about 9.5 miles you will see a roadside rest area for Moccasin Lake on your right. I’ll use this as the base to locate the other lakes. Petes Lake – At the south end of the Moccasin Lake rest area you will see a sign for forest road 2173 and about a hundred feet farther you will see a sign for Petes lake on your left. Follow the signs to Petes Lake. Once at Petes Lake you can park at the boat launch area and photograph and you can also park at the gate for the campground and walk into the campground. This provides a wider range of opportunities. Petes Lake is best photographed at sunrise. Moccasin Lake – Leaving Petes Lake you can drive back to H13 and turn right to return to Moccasin Lake. This is also another great location that is best photographed in the morning. Red Jack Lake – When you leave Moccasin Lake turn left (north) and drive a few hundred feet and turn left on 2261. At the one mile mark you will see a post with forest road 2261a marked on it. Turn on this road and you will Reach Red Jack Lake. Red Jack Lake is best photographed at sunrise although you can also photograph at sunset. Council Lake – When you are finished you can return to forest road 2261 and turn right. This will take you to Council Lake. This lake is best photographed at sunrise although you can also photograph at sunset. Doe Lake – When you leave Thornton Lake turn left and drive to Buckhorn Road. Turn left onto Buckhorn road and drive .8 miles to Doe Lake Road (forest road 2268). Buckhorn road turns right and Doe Lake road continues on straight. After a few hundred feet you will see Big Twin Lake on your right. This can be photographed in the early morning or late evening. Continue on for 2 miles and you will reach Doe Lake. When you reach a section of asphalt you are at Doe Lake. This is best photographed in the morning. 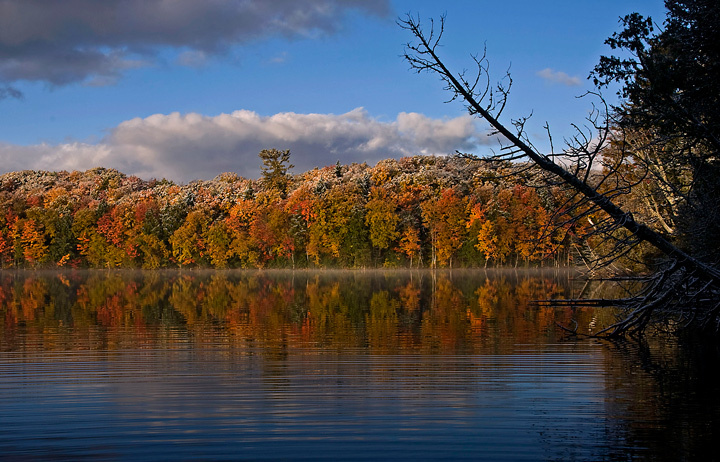 There is a nice listing and maps to Michigan Lakes on the web. There are more photos from Hiawatha National Forest on my website. 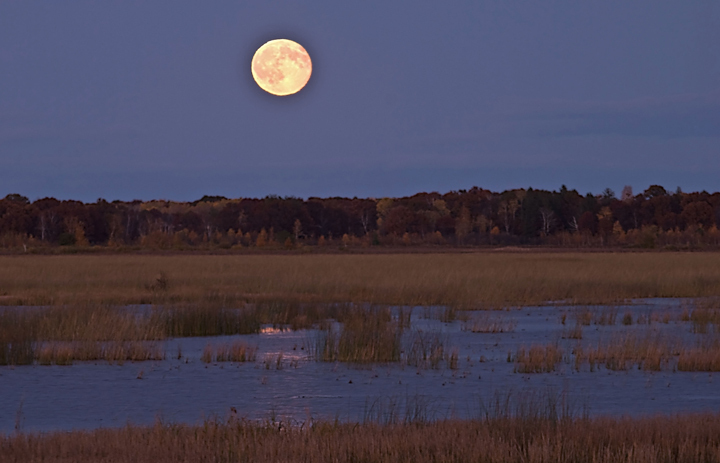 I made my annual fall outing to Crex Meadows, near Grantsburg, Wisconsin, this past week. The fall bird migration is in full swing. 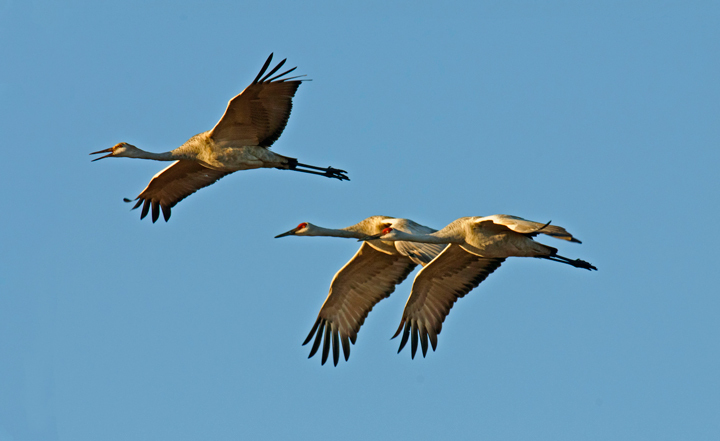 The main attraction are the thousands of Sandhill Cranes. 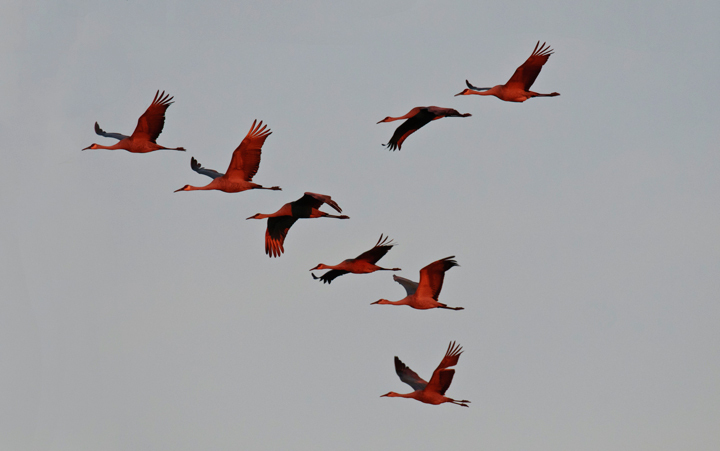 Last week the estimate was about eight thousand Cranes in the area. This year I saw more Sandhill Cranes than in past years although there didn’t seem to be as many Canada Geese around, possibly because they are allowing hunting in the surrounding areas for the first time this year. I try and time my trip to coincide with the full moon so I have to opportunity to shoot the sunset and moon rise as well as the sunrise and moonset. Apparently I’m not the only one who plans their a trip around the full moon because there were more photographers and birdwatchers around this year than ever before. This year was different than the last few years. Northern Wisconsin has been having a drought so the water levels at Crex have been low. As a result many of the birds had been roosting near the dike roads. This year the water levels were high and the birds were forced to seek shallow water and as a result were roosting deeper in the refuge and away from the roads. There was virtually no opportunities to shoot roosting birds this trip. I found the best shooting location was on Main Dike Road just west of the junction of East Refuge Road and Main Dike Road. The birds start returning from their feeding locations about an hour and a half before sunset. Because the birds are nesting deep in the refuge north of Main Dike Road all of the photo opportunities were of birds in flight as they flew over Main Dike Road between West and East Refuge Roads. As an added bonus there was a spectacular sunset. It had been clear during the day and according to the weather reports was going to remain clear. However late in the day a large cloudbank moved in. I thought there wasn’t going to be much of a sunset but at just the right time it cleared on the western horizon creating some fantastic color under the clouds. In the morning the same shooting location works because the birds return to the feeding areas using the same flyways. In the morning there were Canada Geese in addition to the cranes. 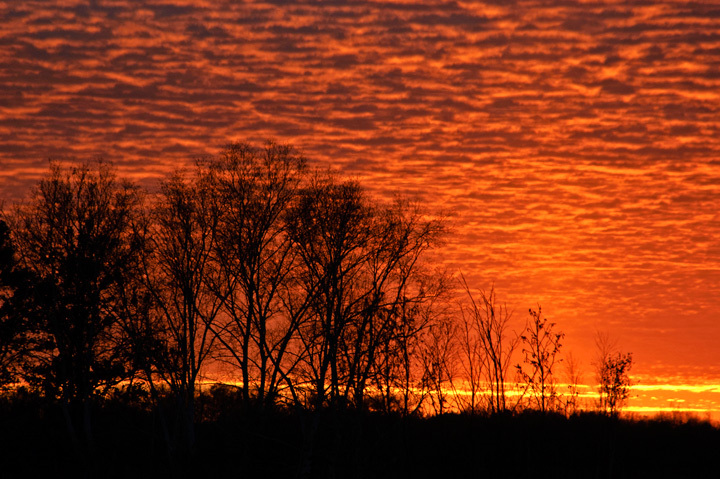 The birds start leaving their roosting area around sunrise and continue to do so for about an hour and a half after sunrise. Normally there are large numbers of birds in the flowages during the day but this year there were relatively few birds mainly Coots in small groups on Phantom Lake. The perimeter flowages didn’t have many birds possibly because of the open hunting season this year. 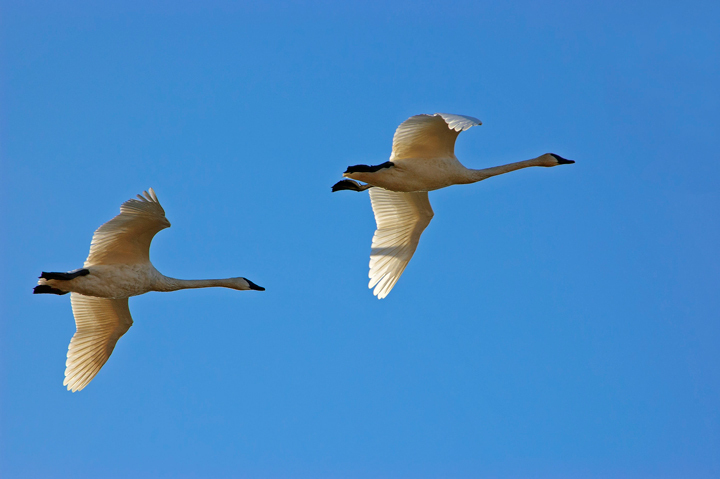 The first day I saw a few Trumpeter Swans back in the marshes but nothing to photograph. The second day they were closer to the dikes and offered some photo opportunities. I also saw a number of Bald Eagles, Osprey and about a dozen Northern Harriers above the marsh areas. This was also the first time that I saw mink along the dike roads. 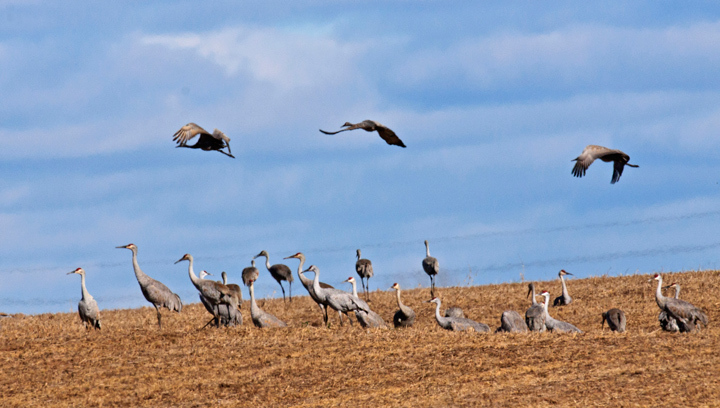 If you arrive in the area during the day the Sandhill Cranes and Geese will be found feeding in the corn and bean fields south and east of Grantsburg. I found flocks of several hundred birds each feeding just off of highway 87 just north of Gretteum flowage. If you drive around you will see birds moving from one feeding location to another. Just follow the birds and you will likely see more. Photographing at Crex can be hard on equipment. Most of the dike roads are dirt and everything is covered with a fine dust by the end of the day. There was also enough traffic to kick up dust for photographers along the road. I had to constantly work to keep the lens dust free and even then ended up with lots of dust spots. You can check on the status of the migration by looking at the Crex Meadow website. Also make sure you stop at the great visitors center. They can be very helpful in directing you to the best locations and time as well as to what type of birds are around. There are more shots from this year’s trip on my website.